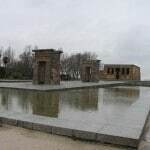 In a park not far away from the Royal Palace and the metro stop Plaza de Espana Templo de Debod can be found. 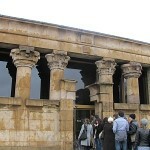 This temple was originally built in Egypt in the 5th century before Christ. 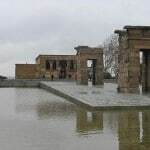 It was later given as a gift from Egypt to Spain as a way of giving thanks for their help with protecting and preserving important buildings and attractions during heavy constructions in Egypt (like the Aswan dam). It is free to enter into the park where this temple can be found, and it is free to enter into the temple as well. Inside the visitor can see original pictures made on the walls of the temple, and it is a piece of Egypt in the middle of Madrid.